When I came across this sweet garden during a parent-teacher conference at JR Tucker High School I felt warm energy fill my heart as I realized that this grassy area is dedicated to my friend Fran Purdum, who served as Lewis Ginter Botanical Garden’s volunteer archivist starting in 1984 when she retired as a science teacher and Science Department chair at Tucker High School until she died last year. Daffodils, Fran Purdum’s favorite, adorn the sign dedicating Liberty Garden to her. Our founder and benefactor, Grace Arents photographed at Skyland. This was one of archivist Fran Purdum’s favorite images of Arents, and one of the many treasures she loved to show others from the Lewis Ginter archives. I remember Fran fondly. She was one of the first people I had the pleasure to meet when I started working at Lewis Ginter Botanical Garden in 2008. She gave me an extensive tour of all the artifacts and treasures that we keep in the archives in the Kelly Education Center basement, including one of her personal favorites: a photo of our founder and benefactor Grace Arents at Skyland in the Shenandoah National Park. 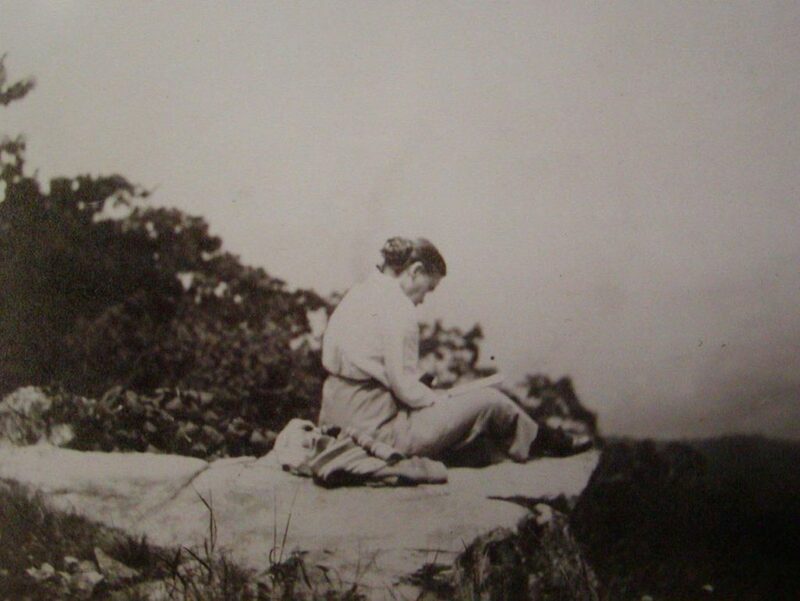 In the photo, Arents is sitting on top of a rock, and she looks like she’s writing or drawing. Fran explained that “Miss Grace,” as she was known to many, was exceptionally shy and didn’t like to have her photograph taken. Because of this, we have very few images of her. Fran also explained, (almost with the familiarity of someone who actually knew “Miss Grace,” that she was a very private person and in order to protect the privacy of her affairs had most of her personal papers burned. She said this with a bit of sadness, for you could see the thirst of knowledge Fran had in wanting to know all that she could about the remarkable woman who left in her will, the property she owned called Bloemendaal Farm, with instructions for it to be turned in to a botanical garden named after her beloved uncle, Lewis Ginter. 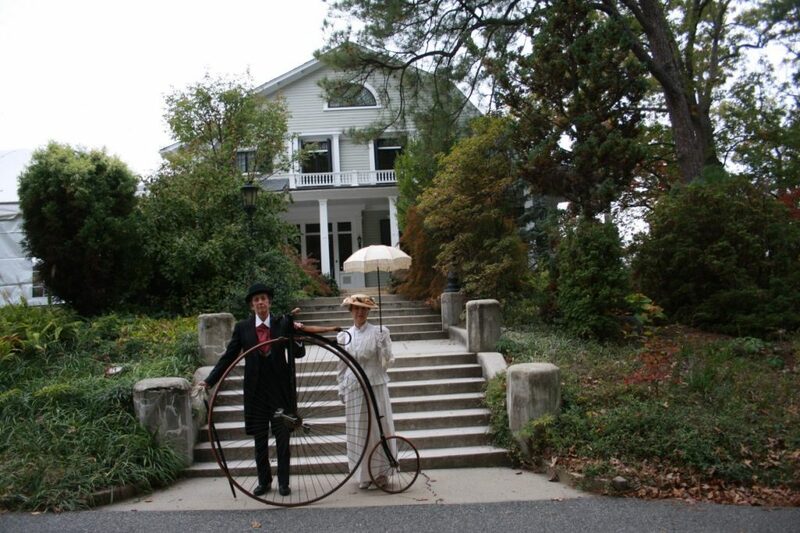 Fran Purdum and Sharon Francisco dressed up as Lewis Ginter and Grace Arents frequently for history events like Heritage Weekend, and the Garden’s 25 Anniversary celebration in 2018. 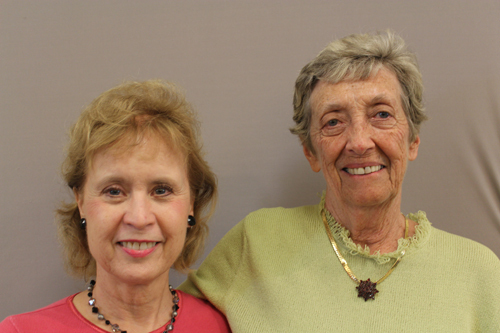 I got to know Fran best when, for Lewis Ginter Botanical Garden’s 25th-anniversary celebration, I photographed her and another long-time volunteer, Sharon Francisco. Fran was happy to dress as Lewis Ginter himself. 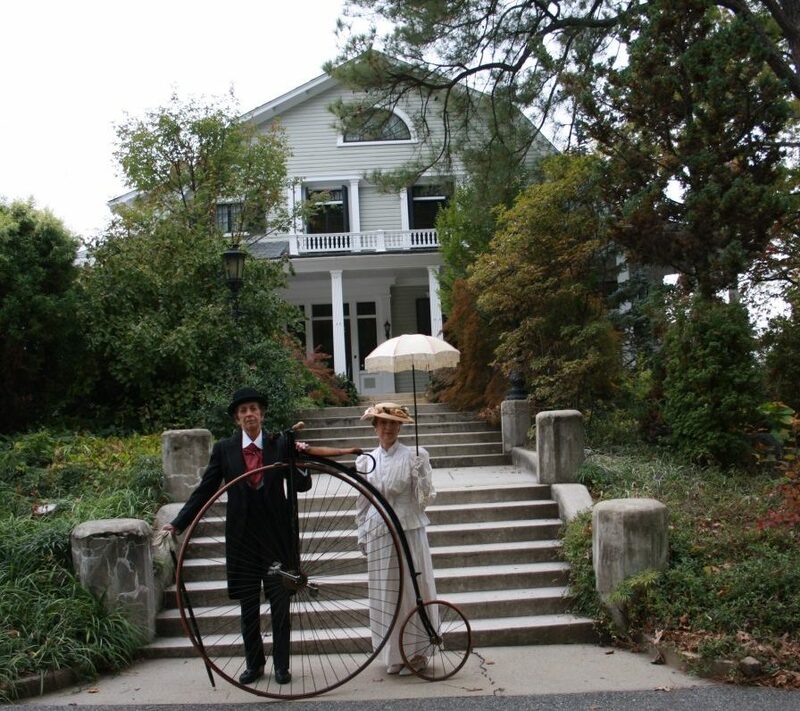 Her friend Sharon dressed up as Miss Grace and they stood to hold a giant penny-farthing bicycle in front of the old Lakeside Wheel Club (now Bloemendaal House). Oh, what a team they made! What a remarkable woman. And, I had almost forgotten, until I came across this photo while researching this article, that Sharon and Fran also did a wonderful interview for StoryCorps about the Garden’s history. 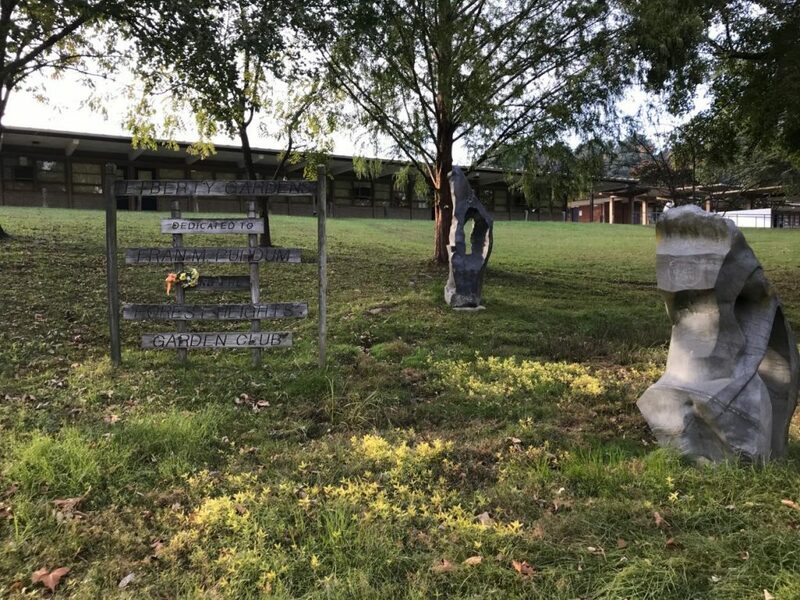 So, as I walk by this beautiful green space each time I visit Tucker, I look at the large trees and green grass, and daffodils that are surely hiding deep in the soil waiting for just the right moment to burst out, and I think of Fran and her love of learning. More than anything, Fran stood for education. She loved to share her knowledge with others and influenced more people than she realized. I imagine her taking her students outside the classroom to learn about the natural world — a tradition very much in line with how Lewis Ginter thinks children learn best. I have a hunch that the Tree Trail project managed by the International Baccalaureate students at Tucker, and that continues today, is probably also her legacy. You didn’t have to be a student of Fran’s to learn from her. Her infectious enthusiasm made it hard not to learn while in her presence. It’s no accident that she was named Henrico County’s first-ever Teacher of the Year. 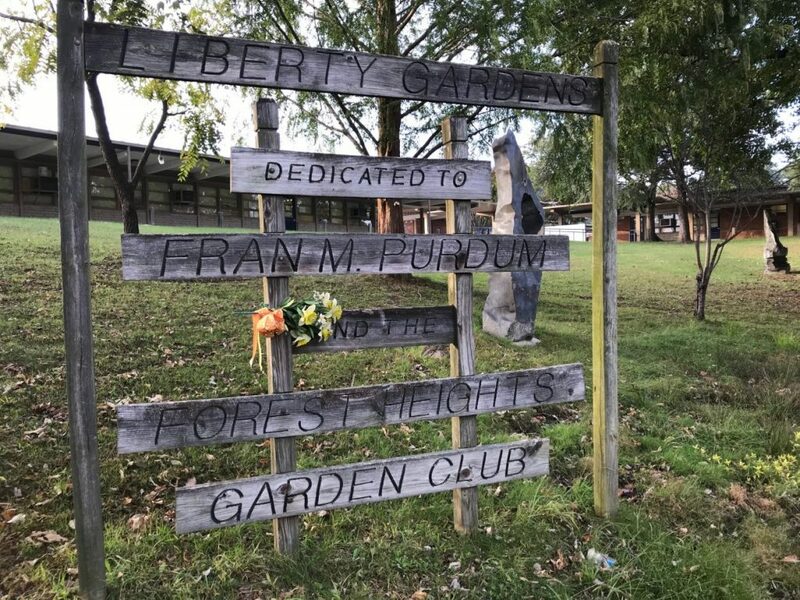 Fran Purdum died in February 2017, but her legacy lives on at Tucker at “Liberty Gardens.” I know the teens at this school appreciate this green space. Tucker is one of the few schools in Henrico where the kids can eat lunch outside every day and, with this garden, they have a beautiful space to be. Truth be told, the outdoor campus is one of the reasons my son chose to attend this school among many options. As Henrico County rebuilds Tucker next fall in a much-needed renovation, I hope that they will preserve this green oasis that commemorates a wonderful woman. I think Fran would want them to keep each and every tree — keeping in mind how trees positively affect learning. Fran especially loved daffodils and I can’t wait to see this area is filled with them in spring! May the road rise up to meet you. May the wind be always at your back. May the sun shine warm upon your face, the rains fall soft upon your fields and, until we meet again, may God hold you in the palm of His hand.